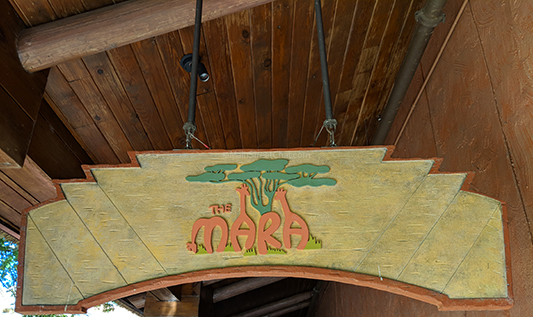 The Mara is the quick service location for Animal Kingdom Lodge, and can be found at Jambo House. 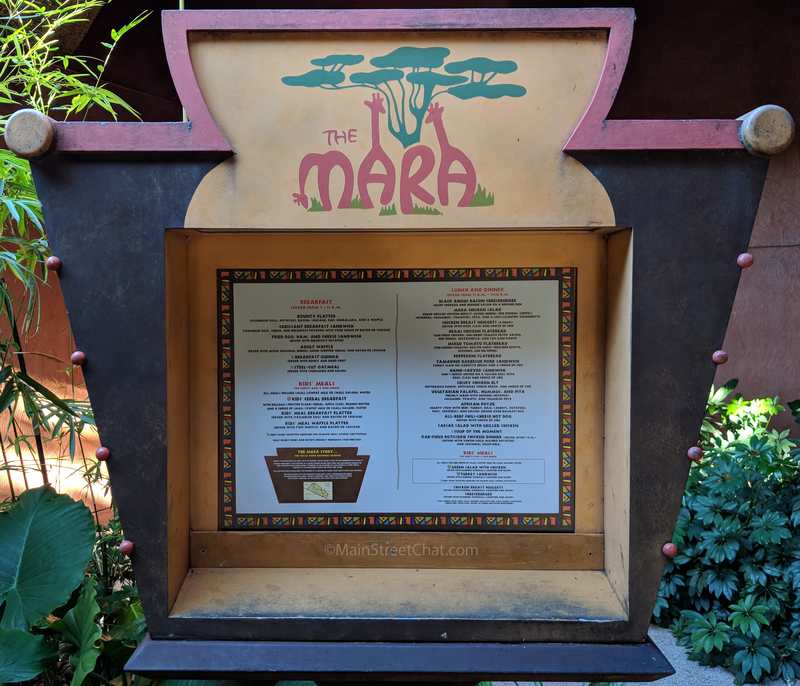 The Mara has an extensive menu that changes for each meal of the day. Located directly across from the pool at Jambo House, there’s plenty of indoor and outdoor seating. Due to The Mara only being accessible from the outside of the Resort, it can be an unpleasant experience getting there during summer months (it rains most afternoons in Florida). The walk way to The Mara is covered but during a heavy storm you will likely get rained on. The Mara is the name of a river that flows through Kenya and Tanzania. The interior is reminiscent of the African Savannah, diners are protected by a tree with great limbs stretching over the seating area.We love the feeling of this quick service and feel that it is the best themed of the deluxe resorts. Breakfast is similar to most Deluxe Resorts. It’s quick, easy to make items like sandwiches and waffles. Pastries, oatmeal, and quinoa is also available. Lunch consists of burgers, flat breads, sandwiches and salads. Most items will come with a side of fries. Dinner has an expanded menu with roasted chicken and slow cooked ribs. Breakfast is comparable with other deluxe resorts. 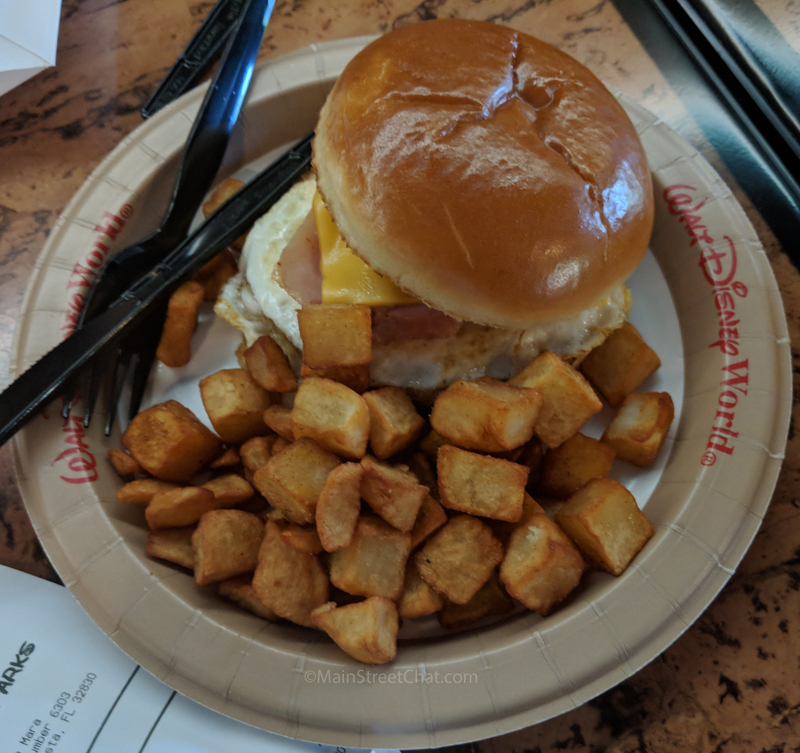 Options were limited , two breakfast sandwiches, pastries, a bounty platter (eggs, sausage, waffles) and Mickey Waffles. We opted to try the Ham, Egg, and Cheese Breakfast Sandwich. This is probably our least favorite breakfast at a quick service location. It was very greasy. The ham hadn’t been properly de-boned, so we got a few bone shards in the sandwich. The house potatoes were also heavily salted. I would suggest skipping the Ham, Egg, and Cheese Breakfast Sandwich and maybe going for the breakfast croissant which has always been a solid choice for us in the past. The other items we tried included a chocolate croissant and a braided cinnamon twist. The baked items were very solid choices and we would happily order them again. In particular, the cinnamon twist, was very good. The Mara’s lunch options were more interesting and had some extra flair to them. Adolfo and I both feel that our meal at lunch was of much higher quality. The Crispy Chicken Sandwich is an excellent option if you are looking for a hearty meal. The sandwich comes on a good quality roll. Along with two chicken patties, bacon, cheese, and a ranch aioli. We recommend adding some tomatoes and lettuce to this to help break up how salty the sandwich can be on its own. The sandwich was very large and between the two of us we were only able to finish 3/4ths of it. Hands down the best thing we got for lunch at The Mara was the Braai Chicken Flatbread. The flatbread had a nice crispness to it and was loaded with mozzarella, large pieces of wood smoked chicken, red onions, pesto, bacon, and a sag dahl ranch. This was so delicious and we cannot recommend it enough. It was perfection on a flatbread. The only thing to be aware of, again, is that the flatbread was very salty due to it having pesto and ranch. The flavors melded together really well but it was also very rich. While we loved it we were not able to finish it. We tried two desserts at The Mara and they were on opposite ends of the spectrum. 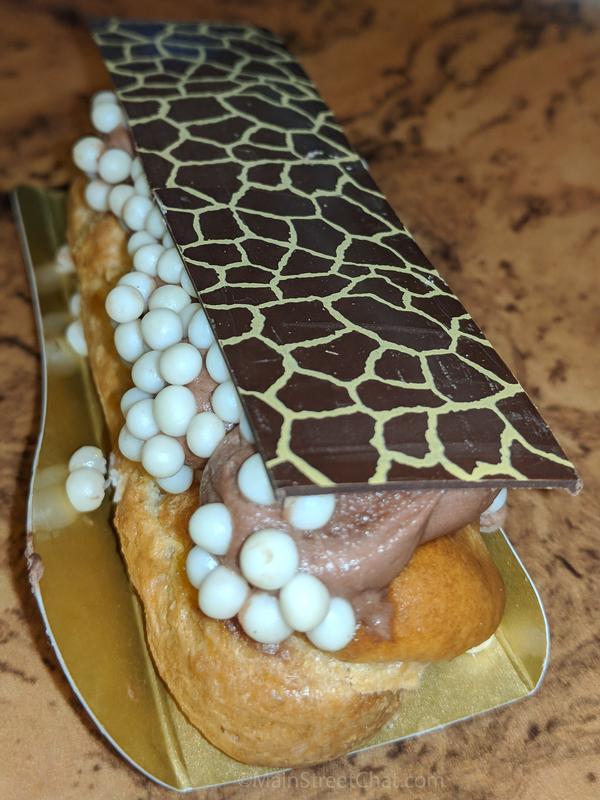 The Giraffe Eclair was delicious. It was a standard chocolate eclair with vanilla custard. Fortunately, the worst thing that can be said is that the puff pastry was a little eggy but it was pretty to look at and the custard inside was really good. We also got the Flamingo Cake. This was very unappetizing, frankly it was gross. I have no nice way to put this unfortunately because it was that bad. The cake was very dry (think over cooked bran muffin) and had a slight cinnamon flavor too it. The consistency of the cake was hard to get over. The cake itself was not sweet at all. It tasted more like bread with cinnamon. The Flamingo Cake had a chocolate frosting that was dense and dry also. Trying to get the cake out of it’s container was a challenge. 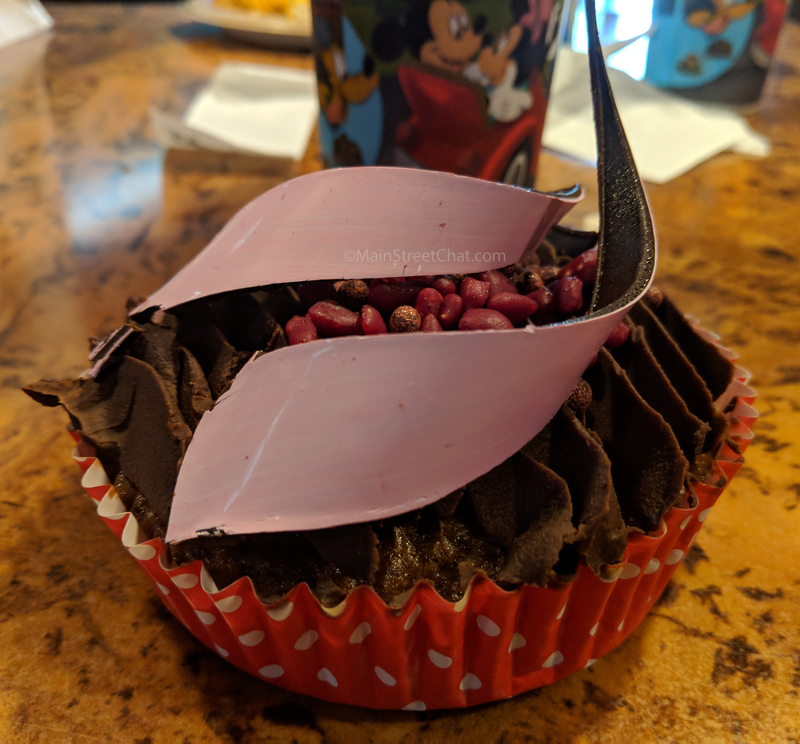 To top off the bad cake and overly dense frosting it was topped with very tart chocolate covered pomegranate seeds. Nothing in this dessert made sense. Out of three adults and a toddler, no one liked it. Everyone tried it because Elyse forced them too and everyone agreed it was bad, as in the worst thing we have ever had on Disney Property. Do we recommend leaving a park to go to The Mara? From Animal Kingdom Park the answer is maybe. Mostly we recommend it if you were already planning on making a stop at Animal Kingdom Lodge. It’s a great place to check out some African based cultural activities, savanna animals, or try the famed Zebra Dome. If you are already planning activities nearby we hands down recommend stopping into The Mara for lunch or dinner. We do not recommend it for breakfast. GO TO BOMA FOR BREAKFAST!!!! See that review here. We do not recommend leaving any of the other parks to eat at The Mara. It’s just too much of a time commitment. Animal Kingdom Lodge has two buildings. One thing to note if you are staying at Kidani Village is that The Mara will be your quick service location for Lunch and Dinner. Breakfast is available at Sanaa. There is a bus that goes between Jambo House and Kidani Village that makes going between the two buildings quick and painless. 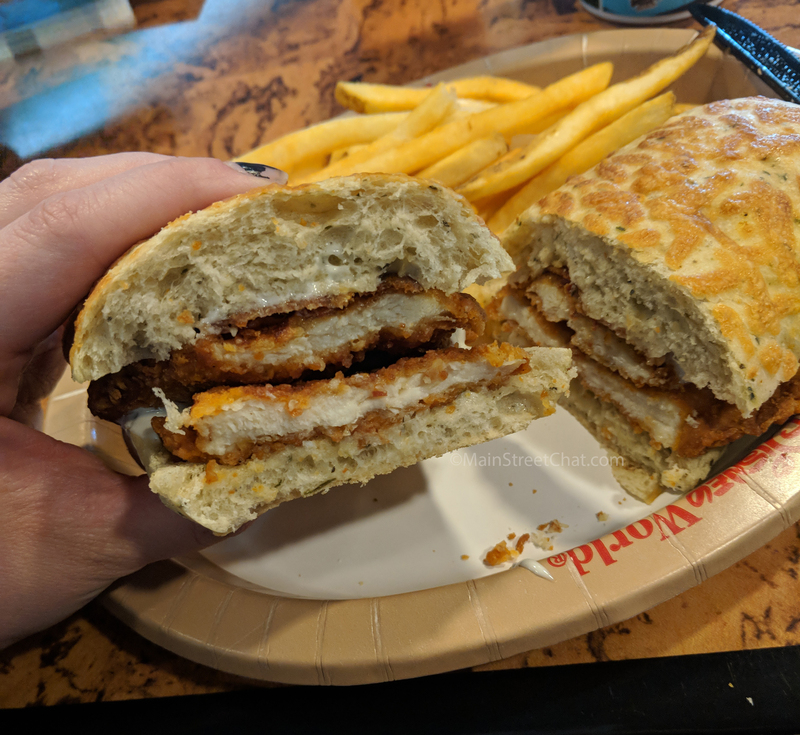 Want to see what else is available at Animal Kingdom Lodge? Check out our Boma Dinner Review or Sanaa Lunch Review.